1. We snack on healthy food. 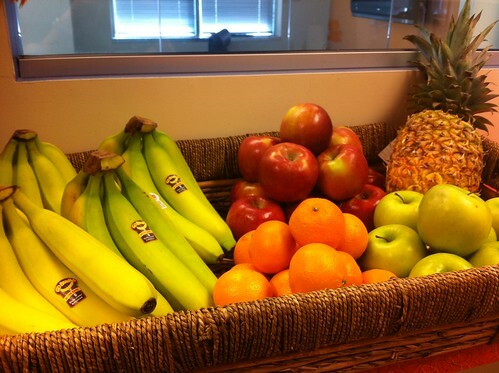 The free fresh fruit perk has been around for awhile at Viget and has since expanded to healthier snacks in general, such as carrots, celery, and yogurt. 2. We trade 4 wheels for 2. Bikes are a popular mode of transportation at Viget. We bike to and from work, use the Vigebikes to grab lunch, and even bike around the office. 3. We stand for a healthier lifestyle, literally. A handful of us decided to forgo our office chairs and start using standing desks. Sitting < Standing < Biking while working! 4. We hit the Vigegym. Twice a day for 5 minutes at a time, a group of us meet at Vigegym – a no-sweat, muscle-toning gym we've created right in our office! We do small, low-impact exercises such as leg lifts, planks, push-ups, wall sits, and crunches. It's not much, but every little bit helps. And, if all else fails, Viget still covers 100% of our healthcare.